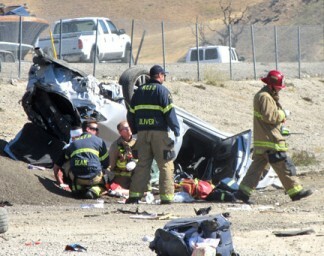 Kern County firefighters tend to a survivor of a rollover crash from Interstate 5 that ended up west of Lebec Service Road just north of the Lebec overpass. There was one fatality. Above: Looking north at two large gravel piles, both of which the car hit as it flew through the air. 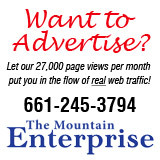 At top: Looking south at the Lebec overpass where the car came off the freeway.